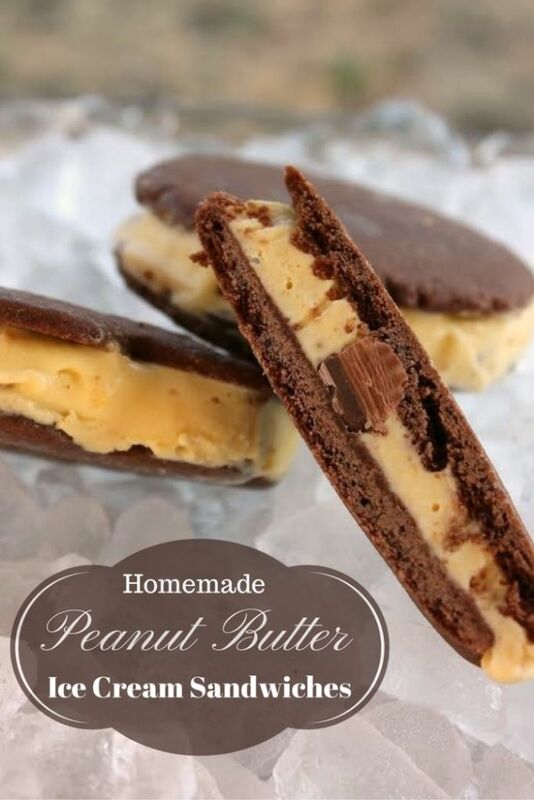 Homemade chocolate wafer cookies complement a vanilla ice cream filling, rich with swirls of peanut butter and chopped peanut butter cups. Cold and sweet, ice cream sandwiches are always a welcome treat in hot summer weather. Round sandwiches are shown here, but the cookies can be formed in any shape you desire. If you would like to make traditional rectangular sandwiches, roll the dough and cut it into rectangles of equal size. The ice cream can be frozen in a cake pan and cut into shapes to fit the cookies. Once you’ve made this recipe, discover its versatility by using fresh fruit or flavorings in place of the peanut butter and peanut butter cups. In a small bowl, whisk egg yolks well. In a medium pan combine milk, cream, and sugar. Heat on medium high until the mixture begins to boil. Remove from heat and pour 1/3 of the mixture into the bowl with the egg yolks, whisking vigorously. Pour the milk and egg mixture into the pan and whisk well. Return to the burner, turn heat down to medium, and bring to a low boil. Stir continuously for 1 minute. Adjust heat as necessary to keep the cream mixture to a low boil. Remove from heat and stir in the vanilla. Cool quickly by setting the pan into a larger pan or bowl with ice water and stir occasionally until the mixture is cool. Refrigerate for at least 4 hours. Pour cream mixture into ice cream freezer and follow your machine’s instructions. When the ice cream is still slightly soft, add the chopped peanut butter cups. Swirl the peanut butter into the ice cream with a rubber spatula or wooden spoon. Freeze until ready to assemble ice cream sandwiches. In a large bowl, cream together the butter, sugar, and vanilla. Add egg and cream and mix together well. Mix in the flour, cocoa, baking powder and baking soda until well combined. Place the cookies at least 1 inch apart on ungreased cookie sheets. Bake for 8-10 minutes. Cookies should feel slightly soft when pressed with your fingertip. Slide the parchment onto cooling racks and let the cookies cool completely. Allow the ice cream to soften just until manageable. Spread onto one cookie and top with another. Press down gently. Run a knife or spatula around the outside edge to remove any excess ice cream. Wrap each sandwich individually as soon as it is completed and place in freezer, using plastic wrap, foil, or waxed paper. Freeze until solid. Peanut butter and ice cream…yes please! 🙂 I would love to have you link it up to my Feature Friday Link Palooza! Those are gorgeous little sandwiches! Peanut butter and chocolate is def my favorite. Saving this! I love ice cream sandwiches!! We are not used to peanut butter here in Greece, but this is a must try recipe! I am visiting from the Fluster link party! OMG!! My fave! Thanks for sharing it on TWS! Ooh, yum! You can’t go wrong combining peanut butter and chocolate! Can’t wait to try this!